BEIRUT -- A U.S.-backed Syrian force said Tuesday that it had begun an offensive to capture the northern city of Raqqa, the de facto capital of the Islamic State of Syria and Iraq (ISIS) group, after months of clearing operations. An American commander said the battle will be long and difficult, but success would deliver a decisive blow to the idea of ISIS as a physical caliphate. By early afternoon, opposition activists said U.S.-backed fighters were trying to break into the city from the east, triggering intense clashes. Raqqa was among the first cities captured by ISIS, in January 2014, and has been the home of some of the group's most prominent leaders. The battle for the city is expected to be extended and bloody, and could mark a major turning point in the war against the extremists. Talal Sillo, a spokesman for the Kurdish-led Syrian Democratic Forces, told reporters that operations have begun in coordination with the U.S.-led coalition. "We declare today the beginning of the great battle to liberate the city of Raqqa, the alleged capital of terrorism and terrorists," Sillo told a news conference held in northern Syria. "Morale is high and military readiness to implement the military plan is complete, in coordination with the U.S.-led coalition." SDF fighters began advancing toward Raqqa in November, capturing wide areas of northern Syria from the extremists. Last week, they reached the northern and eastern gates of the city after intense clashes under the cover of U.S.-led airstrikes. ISIS militants are not expected to give up easily. Iraqi forces launched an offensive to capture the northern city of Mosul, the largest held by IS, in October, and heavy fighting is still underway there. Lt. Gen. Steve Townsend, the top U.S. commander in Iraq, said the twin offensives against Mosul and Raqqa are hurting the Islamic State group's prestige and ability to recruit new loyalists. "It's hard to convince new recruits that ISIS is a winning cause when they just lost their twin 'capitals' in both Iraq and Syria," Townsend said. He said U.S.-led coalition forces will continue to support the SDF in Raqqa, providing equipment, training, Intelligence and logistics as well as precision firepower. "We all saw the heinous attack in Manchester, England," said Townsend, referring to a bombing that killed 22 people last month and was claimed by ISIS. "ISIS threatens all of our nations, not just Iraq and Syria, but in our own homelands as well. This cannot stand." "The International Coalition and our partner forces are steadily dismantling the physical caliphate of ISIS," said Townsend. "Once ISIS is defeated in both Mosul and Raqqa, there will still be a lot of hard fighting ahead, but this coalition is strong and committed to the complete annihilation of ISIS in both Iraq and Syria." Townsend added that once Raqqa is retaken, the SDF have stated it will be turned over to a representative body of local civilians who will provide security and governance. The U.S.-SDF partnership has complicated relations with Turkey, which views the group's Kurdish component as an extension of a terror group operating inside its own borders. Turkey has remained hostile to the Kurdish People's Protection Units, known by their Kurdish acronym the YPG, which form the backbone of the SDF. The YPG are close to the Kurdish PKK insurgent group in Turkey, which is designated as a terror organization by NATO and the U.S.
Turkey's Prime Minister Binali Yildirim said Tuesday his country will respond if an offensive by the SDF on Raqqa poses a security threat to Turkey. He criticized the United States for launching the Raqqa offensive with SDF. ISIS stormed across large areas in Syria and Iraq in 2014, declaring a self-styled Islamic caliphate. But it has lost much of that territory over the past two years following grueling campaigns by an array of Syrian and Iraqi forces. The fighting has devastated communities in both countries and forced hundreds of thousands of people to flee their homes. ISIS has been fortifying its positions in Raqqa for months, setting up barriers and hanging sheets of cloth over main streets to provide cover from warplanes. A belt of land mines and militant checkpoints circle the city. The humanitarian NGO International Rescue Committee said it is deeply concerned for the safety of civilians in the city, adding that the number of people escaping Raqqa has dropped. That may indicate that IS "intends to use the 200,000 people still trapped in the city as human shields," the group reported. The Britain-based Syrian Observatory for Human Rights reported heavy clashes on the edge of Raqqa's eastern neighborhood of Mashlab as well as inside Division 17, a former Syrian army base now controlled by IS north of the city. It said SDF fighters captured several buildings in Mashlab. Earlier Tuesday, state news agency SANA reported that the airstrikes by the U.S.-led coalition killed 12, including women and children. It said the families were fleeing the city in boats across the Euphrates River ahead of an expected all-out attack by the SDF. The Observatory said 21 people were killed in the Monday night airstrikes. It said they were likely carried out by the U.S.-led coalition. 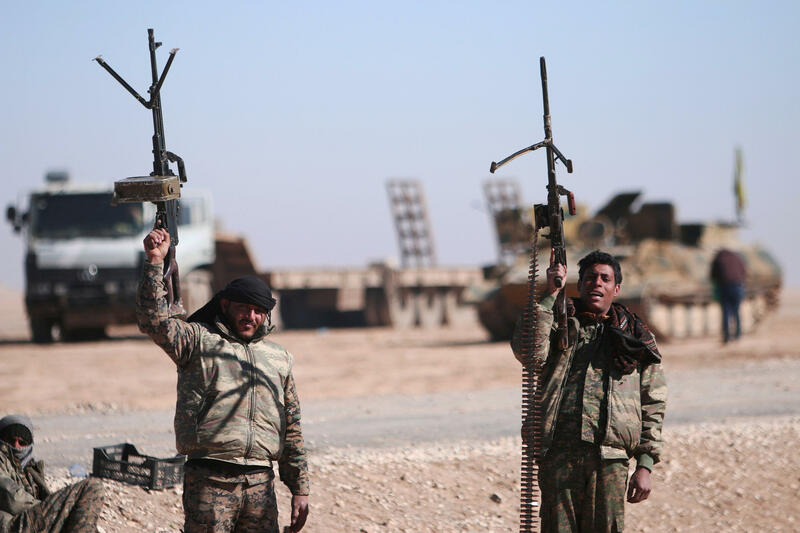 Talal Sillo, a spokesman for the Kurdish-led Syrian Democratic Forces, told reporters that operations had begun in coordination with the U.S.-led coalition. SDF fighters began advancing toward Raqqa in November, capturing wide areas from the extremists. Last week, they reached the northern and eastern gates of the city. Raqqa is currently surrounded from the east, north and west, and opposition activists reported intense shelling on the city since Monday night, which killed at least 12 people. State news agency SANA reported on Tuesday that the airstrikes by the U.S.-led coalition killed 12, including women and children. It said the families were fleeing the city in boats across the Euphrates River ahead of the expected all-out attack by the Kurdish-led Syrian Democratic Forces. The Britain-based Syrian Observatory for Human Rights said 21 people were killed in the Monday night airstrikes, which it said were likely carried out by the U.S.-led coalition. Airstrikes had intensified in recent weeks as SDF fighters reached the outskirts of the city. The battle for Raqqa is likely to be long and bloody, and the extremists are not expected to give up easily.